Soup shows up on my menu year around and even more so when the weather gets cooler. There is something so satisfying and comforting about a bowl of steamy hot soup. 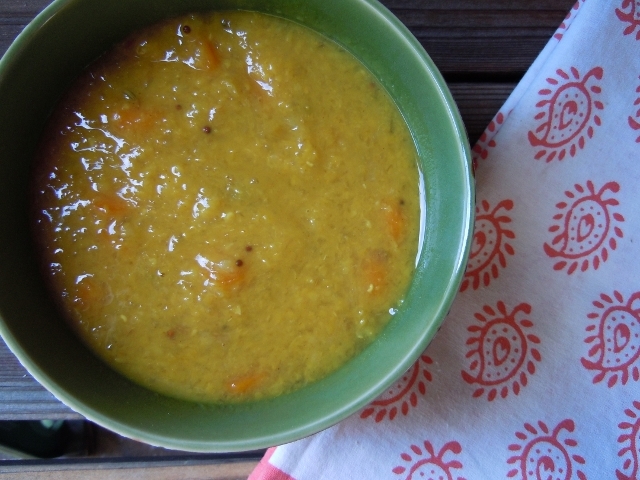 This Curried Split Pea Soup has quickly become one of my favorites. In fact I have made it 4-5 times already but for various reasons it never got photographed! Its an unusual twist on split pea soup with the choice of Indian spices like curry, ginger, fennel and cumin seeds giving it a fresh new flavor. The black mustard seeds are optional and the first two times I made it without them. I came across some black mustard seeds at Whole Foods and I do think they are nice addition to the soup. When I went to the store to get the ingredients for this soup I had it in my head that it called for yellow split peas but when I got home and prepared to make it I realized the recipe said green split peas. Oh well, I used the yellow split peas and since it turned out so fabulous that is how I continue to make it. Although this is a pressure cooker recipe I am sure you could also make it in a slow cooker. It comes from a fantastic new cook book I purchased called Great Vegetarian Cooking Under Pressure by Lorna Sass. I am loving my pressure cooker – it is so easy to use and makes quick work of getting a tasty nutritious meal on the table. It’s not spicy hot from the curry powder at all. I would say the flavor is more delicate and mellow with a slight sweetness from the whole fennel seeds. If you don’t already have these spices in your cupboard go ahead and get them as this recipe most likely will be a repeater in your house. I seem to make it once a week and it disappears quickly! I made this for my mom and dad and they loved it. You can substitute parsnips for the carrots and stir in some chopped spinach, chard or kale at the end if you want to boost the nutrition even more. I like to top it with some fresh cilantro. Heat the water in the pressure cooker using the saute setting, add the cumin, fennel and black mustard seeds and stir for 5-10 seconds. Stir in the ginger, garlic and onions, stirring frequently cook for 1-2 minutes. Add carrots, boiling water, split peas and curry powder. Give it a good stir making sure to scrape the bottom of the pan to remove any onions and seasoning that might be stuck. Lock the lid in place. Cook for 6 minutes on high pressure. For a hearty texture use the quick release for a smoother texture let the pressure come down naturally. Add salt or fresh lemon juice if desired. Garnish with fresh cilantro – optional. Note that I have not made this recipe in the slow cooker but I have made many other split pea soup recipes this way with good results. Heat water or oil in a non stick skillet, add cumin, fennel and black mustard seeds stir for 5-10 seconds. Stir in the ginger, garlic and onions, stirring frequently cook for 1-2 minutes. Put mixture into your slow cooker, add carrots, boiling water, split peas and curry powder. Give it a good stir, put lid on slow cooker. Cook on high for 4 hours or low for 8 hours. Add salt or fresh lemon juice if desired. Garnish with fresh cilantro – optional. Brrrr – it was a chilly 47 degrees when we walked this morning and I had to break out the mittens! We quickly warmed up but that cold air is a shocker to the system. Do we burn more calories when we walk in the cold? I hope so. Even once it gets cold we continue to walk outside and just add more layers. We have even been known to walk in the rain! 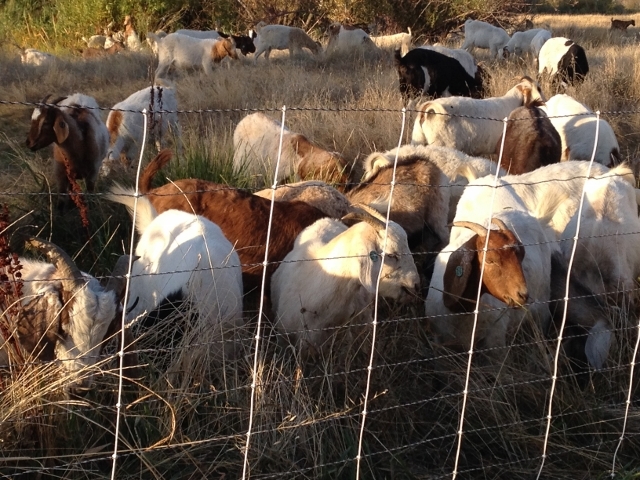 The goats are back along side our walking trail! Everyday they get moved to a new location as they eat down the wild grasses along the bike/walk trail. They are amazingly quiet and are so busy eating they don’t seem to notice us at all. It’s kind of fun to see them every morning so I am sure we will miss them once their work is done. Add your comment or feel free to ask me a question. 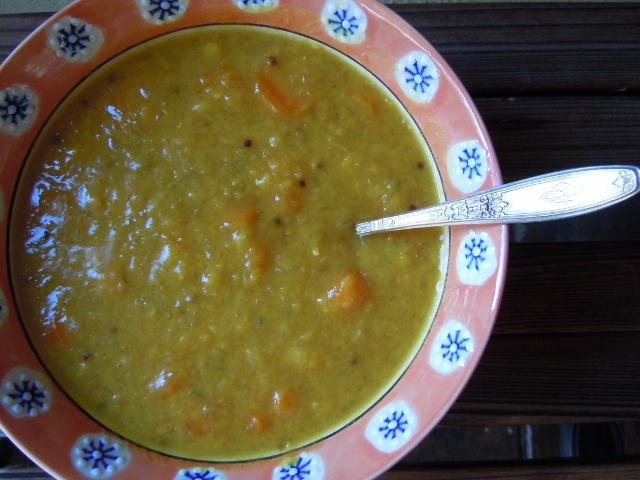 Split Pea Soup – love it or hate it? Does your exercise routine change with the weather? I have a pressure cooker that my in-laws gave me years ago for Christmas, but I only used it a couple of times. Just a couple of weeks ago, I was considering giving it away. I will have to keep it and try this recipe because we all enjoy split pea soup. Looking forward to seeing other recipes from you using the pressure cooker. I don’t walk in the neighborhood during winter or summer. Two years ago I bought an elliptical for that reason. If you like split pea soup must give it a try Sue. Another good PC recipe is this one http://nutmegnotebook.com/2013/09/portabella-mushroom-chili/ and also this one http://nutmegnotebook.com/2013/09/red-lentil-chili-unprocessedcookbook-winner-announced/. You know, I have never had split pea soup. Ever. I am not a fan of peas, so I have never bothered to try it. My exercise really does change with the seasons. I can’t really bike in the snow. Biking is becoming more limited now and time to start thinking about moving it indoors. My exercise moves indoors when the tips dip below 50 or so. On sunny days, I might layer out and go for a walk, but I’m also happy going to the gym and using that equipment. Since I work from home a good bit of the time, it’s a good way to get out amongst people for a change. I have not had pea soup in so long that I do not even know if I like it anymore! 😉 Looks god though! I make a very similar split pea soup. Sounds delicious! Love the goats! How great to see them on your walks! I WANNNNNA say I hate split pea—but Ive made it to 44 without ever trying…. What a lovely and hearty soup – looks so delicious! I’ve never had black mustard seeds – what do they taste like? Wow 47 degrees! Right now it’s mid 70s in Buenos Aires, and it’s their Spring season. I love Split Pea Soup, and Split Lentil Soup 🙂 just love the term Split. I haven’t been exercising lately except for long walks in the cities for the past few months. The black/brown mustard seeds are a little pungent. Enjoy that Buenos Aires springtime weather! I would like to know which Rubbermaid containers do you use for FREEZING soups, plastic or glass in particular for soup? I’m enjoying reading your recipes. I use the Rubbermaid Take a long 4 cup square containers. I buy them at Target. The are plastic. I hand wash them – nevr put them in the dishwasher.